The Mexican state of Quintana Roo - where Cancun, Playa del Carmen and Tulum are - contains a large percentage of Mexico's parks and reserves, 20% of its territory being covered by some sort of environmental protection. In the past five years there has been a number of ecotourism developments in these protected areas. Some of the ecotourism projects, like the Sian Ka'an, make a solid effort to protect the natural resources and educate visitors. Other projects are primarily commercial, with an interest in promoting tourism solely for the tourist dollars. 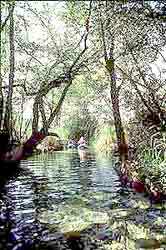 Mexico's natural park budget is small and private companies do control many of the popular ecotourism destinations. If you want guidance about what to see, Alltournative Expeditions offers scheduled tours to most area destinations and can organize a private tour to almost anywhere else. Taninah Eco Vacation Rental - Unique retreat in the jungle across from Xpu Ha beach. Private cenote, swimming pool, game room, wonderful outdoor kitchen. All solor powered and eco-friendly. The house was featured on Home and Garden Television's Extreme Homes. Reservations through Puerto Rentals. CINDAQ - working to facilitate research, promote education, and support conservation of the natural and cultural resources associated with the cenotes and underground rivers of Quintana Roo, Mexico. Eco Travels in Latin America a website with articles and links about ecotourism. CESiaK is located within the Sian Ka'an Biosphere Reserve and has rustic but beautiful environmentally sensitive accommodations, like furnished tents with ocean views. Zahra Hotel is an ecofriendly hotel on the beach in Tulum. Caribbean Coast Travel can set you up with tours and transportation to all the popular Mayan Riviera destinations. Adventure Guide to the Yucatan, Cancun and Cozumel Out of the way towns and ruins, and eco traveler recommendations.